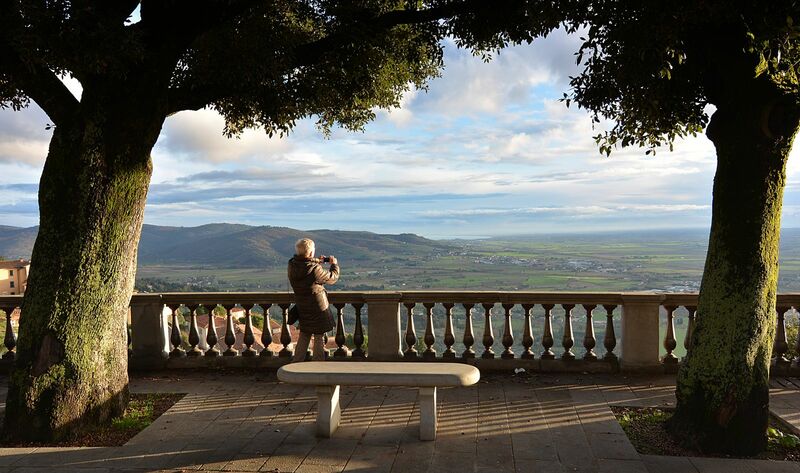 The beautiful city of Cortona lies in the mountains between the Valdichiana and Tevere valley. Cortona was a very important center of Etruscan civilization, and these ancient settlements remain at the core of the city’s identity. Two kilometers of the Etruscan walls, which date to the 5th century BCE, are still standing today. The historical center started to take its modern form in the 13th century, with the foundation of the Palazzo Comunale, the town hall, in 1241, the Church of San Francesco in 1245 and the Palazzo del Popolo in 1250. In 1258, the impressive Girifalco Fortress was built on top of fortifications dating back to the Etruscan era. However, the fortress acquired its current appearance in the 1500s, after many modifications and additions. It offers visitors an exceptional panoramic view of the surrounding plains, and it is frequently used to watch for wildfires. The Cathedral dates to a few centuries later. Construction began in 1456 on the site of the ancient parish church of Santa Maria. In 1480, the Sienese architect Francesco di Giorgio Martini constructed the Sanctuary of the Madonna delle Grazie al Calcinaio, just outside of the city. The city of Cortona is rich with museums and art. The Etruscan Academy Museum is definitely worth visiting, because it features many unique artefacts. The Diocesan Museum is equally fascinating, containing great artistic treasures, such as the Annunciation by Fra Angelico, the Madonna in Glory by Bartolomeo della Gatta and the Deposition by Luca Signorelli. The Archaeological Park and the Abbey of Farneta, are two other sites that should not be overlooked. The summer is a great time of year to visit Cortona because the city hosts Cortona On The Move, a festival for modern photography, from the mid-July through the beginning of October. Festival attendants will enjoy some of the highest-quality photographs from all around the world.